Perhaps it's the weather, but here at DSHQ we've been craving coconut for the past few weeks. We've put it in pudding, in mug cakes, you name it. Of course, the ultimate in sweet, sticky coconut treats has to be coconut ice. How could you possibly make that more indulgent? Err, I don't know, how about by PUTTING IT IN A CAKE. *Hugh Jackman to serve both, obviously, but let's be reasonable here. Preheat the oven to 180C/350F/Gas Mark 4. Grease and line a 23cm, 9 inch deep cake tin. Add the flour in thirds, folding in lightly. When the flour is just incorporated and no streaks are showing, gently stir in the coconut and yoghurt. Dollop into the tin, smooth over the top and bake for 30-35 minutes, or until the top is golden and risen, and a skewer inserted comes out clean. Mix together the condensed milk and icing sugar in a bowl until stiff. Add in the desiccated coconut and work into the mixture with a wooden spoon. Split the mixture in half and add a little pink food colouring to one. Work in until the colour is evenly distributed. Dust a clean surface with icing sugar and get sticky, shaping out one of the halves into a square. Repeat with the other half and place one on top of the other. Roll out, re-shaping every so often, until you have a square of coconut ice about 3cm thick. Using a cake tin as a template, cut out a circle of coconut ice and put aside to set for at least an hour. Eat all the offcuts Shape the remaining coconut ice into cubes or balls for decoration. When the cake is cool, carefully cut it horizontally through the middle. (If you hate cutting cakes, you could split the cake batter between two smaller tins and reduce the cooking time slightly). Dilute the apricot jam slightly with a splash of hot water and stir to loosen. 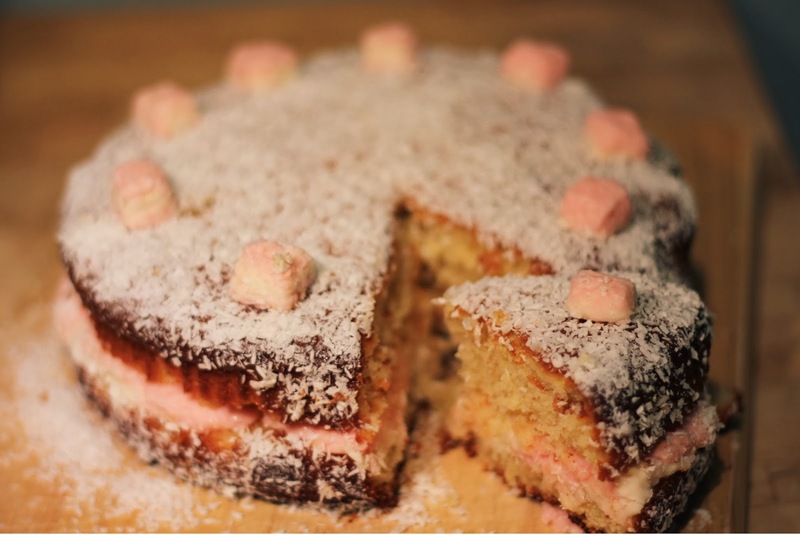 Brush over one half of the cake, then place the circle of coconut ice on top and sandwich on the other cake half. This is not helping my coconut ice craving. I'm going to have to buy some today, in lieu of this glorious cake. I used to love making coconut ice as a kid, seriously need a slice of this!